A few years ago I was on a plane reading a book by Buffett. The flight attendant in my section noticed what I was reading and casually asked me if I was into investing. I replied, “Not really.” She said, “Well, Buffett is really the guru of the investment community.” I gave her the book to peruse for a few minutes. Only problem, she was talking about Warren Buffett. I was reading A Pirate Looks at Fifty by Jimmy Buffett! Now this may seem like an inane answer with probably no real harm done but you can see how easy it is for misunderstandings to occur. People have different levels of communication ability and we have to work with all types if we are to be effective. With some we have to be more explicit, others less so. The key point is to recognize the differences and work to be effective. 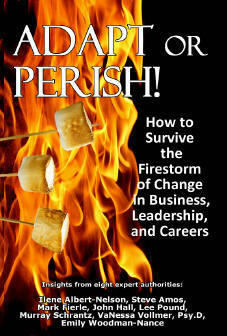 In Adapt or Perish my co-authors focus on honing the traits of being effective communicators, and thus better leaders. Give it a read.